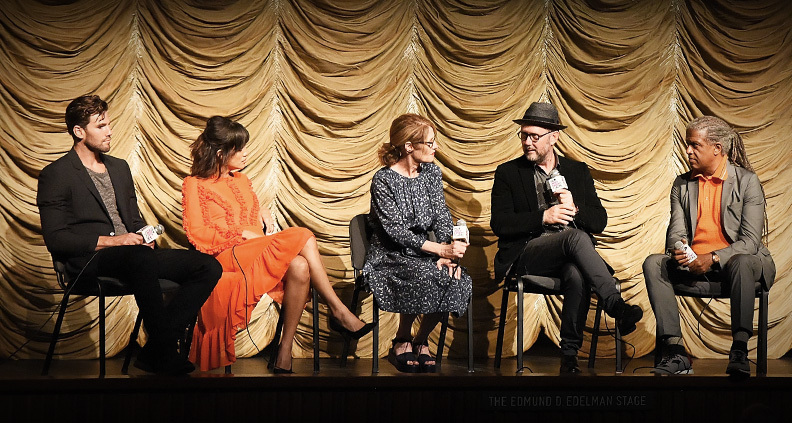 On September 15, Film Independent at LACMA hosted a Members-only screening of Battle of the Sexes, Jonathan Dayton and Valerie Faris’s upcoming docu-drama about the titular 1973 showdown between tennis stars Billy Jean King and Bobby Riggs. Starring Emma Stone (King) and Steve Carell (Riggs), the film chronicles King as she fights for social change, eventually leading to the famously-hyped Riggs match. 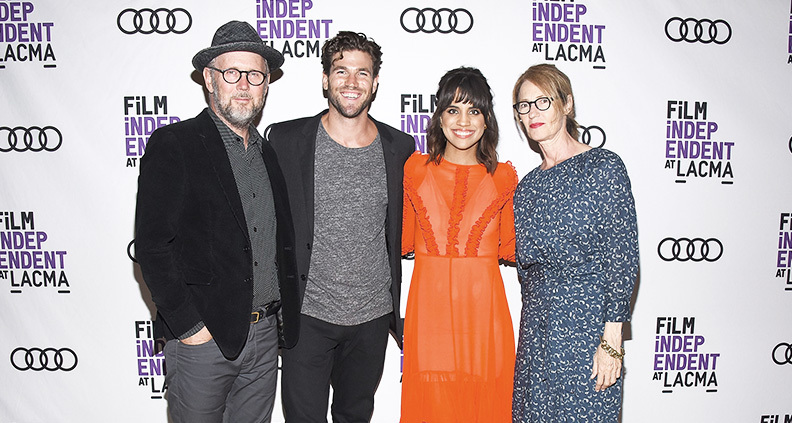 Following the screening, Film Independent at LACMA curator Elvis Mitchell sat down with co-directors Dayton and Faris (Little Miss Sunshine), and actors Austin Stowell and Natalie Morales for a conversation about the making of the film. Dayton and Faris said they approached the project as a contemporary story, not wanting to judge the era or get overly bogged down with recreating 1970s aesthetic signifiers. Despite making a two-hour movie filled with events occurring over a three-year time period, the directors’ overall intention was to highlight the love story between King and Marilyn Barnett—King’s secretary and hairdresser—and how this relationship affected the athlete’s work ethic and personal life. Faris noted that Larry and Billie Jean met at Cal State University, Long Beach. Though Larry was attending on a tennis scholarship, he strongly felt that Billie Jean should’ve received the scholarship as well, since she was a much better tennis player than he was. Later, King continued to support his former spouse during Billie Jean’s fight for Title 9 and equal pay. Mitchell brought up one of his favorite scenes from the film: the monumental phone call between Larry and Billie Jean, demonstrating Larry’s support for Billie Jean even as she doubted herself. Throughout filming, Stowell was inspired by Stone’s acting, which he says helped him portray the supportive character that Larry King evidently was in real life. “Emma does such a great job of portraying Billie Jean, this magnanimous power and presence. It was just about listening to Emma—her energy and voice,” he said. Morales, who plays contemporaneous female tennis star Rosie Casals, spent some time researching old audio and video to get Casals’ “surfer girl” accent and “tight-mouthed” voice right. She recalled filming one Battle of the Sexes scene against archival footage of TV commentator Howard Cosell, and how she had to practice getting the timing just so, just as it was in the original broadcast footage. Though Bobby Riggs had his run in tennis (including a 1939 Wimbledon appearance), he never got the attention he would’ve had otherwise because of World War II. In the public eye he turned up his chauvinistic personality, but according to the filmmakers, Riggs was nonetheless a complicated guy. Dayton and Faris said casting Carell was “no-brainer,” stating that Riggs and the Sunshine actor shared a similar brand of charisma. 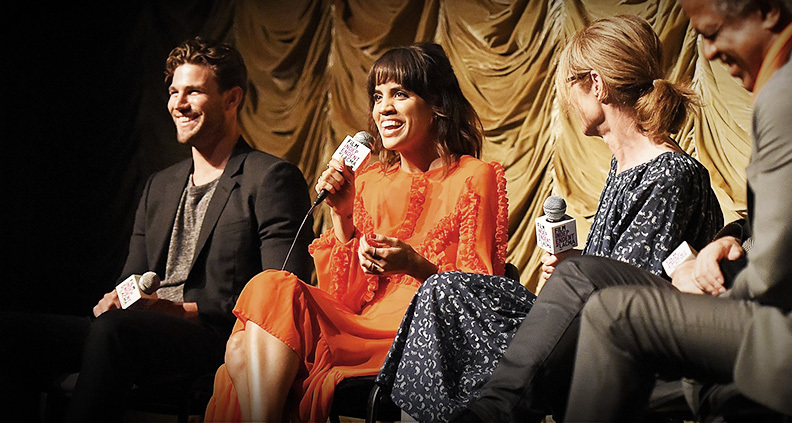 “I think we got all of our first choices [for the cast],” she said. Mitchell asked what it was like working with two directors. Both Morales and Stowell felt positively. Morales said that on a typical shoot, she looks to the director to try and read how she or he is reacting to her performance. But working with Faris and Dayton was a different experience. Farris added that the duo’s characters are frequently people who are longing for something. The directors pointed out that about 75 percent of the scenes in Battle of the Sexes take place in hotel rooms—adhering to the theme of loneliness, since King was away from home most all of the time. “There’s not much life in tight spaces,” they observed. And it was important for them to show this in the film. Battle of the Sexes is currently in theaters. To see what’s coming up at Film Independent at LACMA, click here. 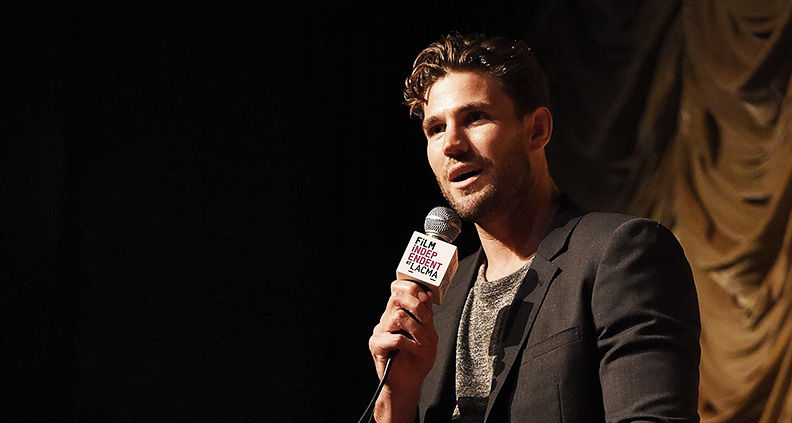 And learn how to become a Member of Film Independent by clicking here.